1,000 Mobikes have been scattered around the city centre as a new bike sharing scheme for Manchester and Salford has been launched. Manchester is the first area outside Asia to adopt the service, initially for a six-month trial but with a view to expand. Mobike is the world’s first smart, dock-free bikeshare platform aimed at helping people make short trips across cities. The orange and silver aluminium machines have non-puncture airless tyres, a GPS tracker, built-in locks and a cashless smartphone app. The bikes are designed with chainless shaft transmission and durable disc-brake, they are hailed by their creators as ‘maintenance-free bikes’ with a four-year fix-free life span. Bosses say they are ‘near impossible’ to vandalise and ‘pointless’ to steal. 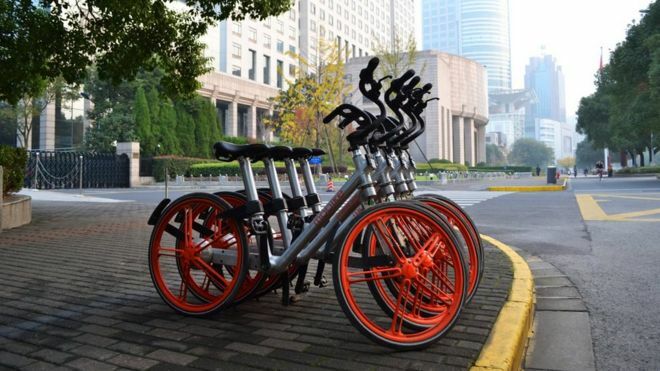 They have developed a credits system where users who defy the Mobike rules – park them in the wrong place for example – will be charged more to hire them. ‘Good users’, meanwhile, will be rewarded. The bikes the brain child of Hu Weiwei, a Chinese entrepreneur. She told the M.E.N at a cycling conference in Holland that she envisions Manchester becoming the ‘Shanghai of Europe’ – doing for bike-sharing on the Continent what Shanghai began in China. Welcomed by city leaders the hope is that they will help tackle congestion and pollution levels.